My first Daring Bakers challenge is complete. Our hosts Ivonne , Lis , Fran , Shea , chose the Opera Cake. Not the traditional Opera Cake with chocolate and coffee flavors. We were told to use any flavors other than the traditional and then go nuts. I chose peach, almond and vanilla. The almond flavor is in the cake, the vanilla is in the cake and buttercream and the peach is in the syrup and mousse. Then the silky white chocolate ganache on top. The aroma was intoxicating as I put the cake to my mouth and the taste was a blend of fruity, creamy, nutty perfection. After photographing my finished "Opera Cake" I served it for Mother’s Day. I had so much fun checking to see what everyone else was doing for their flavors and presentations. Thank you to our hosts for this challenge. I have made traditional opera cakes but this was a whole new adventure, going out of the box and away from tradition. Some of the recipes were adapted from Paris Sweets and Chocolate Passion. Line two ½ sheetpans with parchment paper. Butter the paper. Sift together the almond meal and powdered sugar, set aside. In a bowl of a 5 quart mixer using the paddle attachment beat the eggs to break them up. Add the sifted almond meal and powdered sugar mixture as well as the vanilla. Beat for 3 minutes. Add the flour and mix on low speed just to incorporate. In a clean bowl of a 5 quart mixer using the whisk attachment beat the egg whites to soft peak and while still beating slowly add the granulated sugar. Continue to whisk at high speed until the mixture is at full peak and glossy but not dry. Fold this mixture into the egg, almond meal & powdered sugar mixture. Remove ¼ cup of the mixture and stir into the melted butter. This will allow the melted butter to completely mix into the larger mixture. Fold everything together. Weigh the mixture. Mine weighed 2 pounds 4 ½ ounces. Spread 1 pound 2 ¼ ounces into each prepared ½ sheetpan and bake in a 400 degree convection oven (425 degrees standard oven) for 7 minutes or until light brown. Invert onto a clean sheet of parchment paper and peel off the parchment from the cakes. 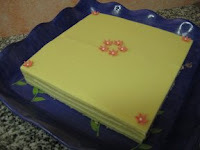 Turn over and use the parchment to cover the cakes. Let cool to room temperature then cover with plastic wrap to keep it air tight. Sugar to taste if your peach juice is not sweet enough. Bring the peach juice and sugar (if using) to a boil and reduce a little to a syrup consistency. Add the Peach Schnapps and refrigerate until ready to use. In a 5 quart mixer beat the butter with a paddle attachment till light and free of lumps. Set aside. Put the eggs and egg yolks in a bowl of a 5 quart mixer with the whisk attached. Whisk for a minute to break up the eggs. Lower the speed to medium high and pour the sugar mixture slowly down the side of the bowl. When it is all incorporated bring the speed back up to high and beat until cool (about 5 minutes). Add the butter a little at a time whisking at high speed. Whisk in the Peach Puree. Heat puree and sugar to about 86 degrees just to melt the sugar. Add the gelatin and stir to dissolve. Whip the cream and fold it into the puree mixture. In the microwave bring the cream to a boil and pour over the chocolate. Stir with a whisk until the chocolate is completely melted. Use at 90 degrees. Cut the cake so you have one piece 10" x 10" and one piece 10" x 5". Repeat with the other cake. You will have two 10" X 10" and two 10" x 5". Put one of the 10" pieces on the parchment lined baking sheet. Moisten it with the peach syrup using a brush. Spread a ¼" thick layer of peach buttercream over the cake. Put small diced pieces of fresh peach over the buttercream and push them down into the buttercream. Put the two pieces of cake that measure 10" x 5" over this, fitting them together so you have a 10" x 10" square. Moisten with the peach syrup. Put all of the peach mousse onto this cake layer and spread out evenly. Put small diced pieces of fresh peach over the mousse and push them down into the mousse. Put the last 10" square cake on top of the mousse layer. Moisten with the peach syrup. Spread a ¼" thick layer of peach buttercream over the cake. Refrigerate at least 30 minutes. Spread the white chocolate glaze over the chilled cake and return to the refrigerator.